I will be the first to admit that this is a bit of an obscure dish. Fine, it is down right weird. 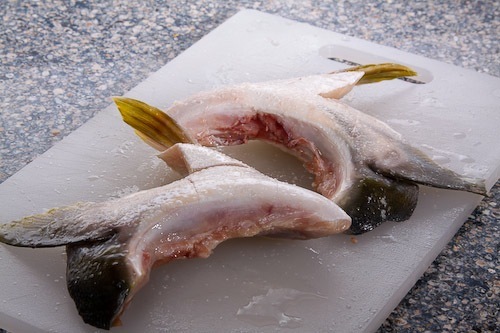 Carolyn was definitely skeptical when I brought home two frozen fish cheeks that still had the fins attached. Fortunately the results were very tasty. 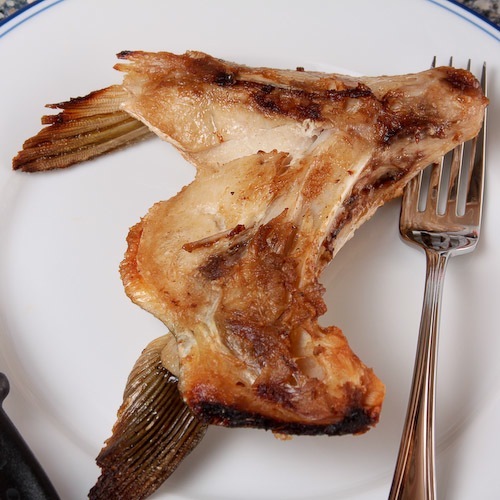 The “collar” is actually what it sounds like–the collar bone of the fish. There are nooks and crannies in the collar bone filled with succulent, tender meat. 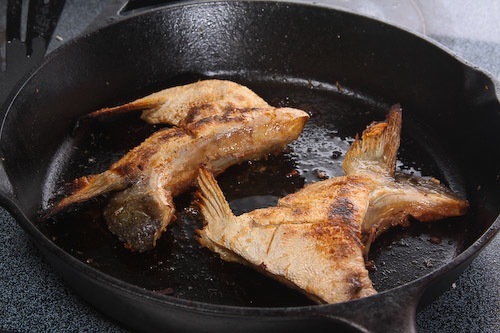 This dish is really simple to make, you simply oil and salt the collars and then broil them. The real challenge might be in finding yellowtail collars. If you are in DC, I can not recommend enough the Hana Japanese Market, which recently opened. The manager is very helpful and had a great tip; make deep slashes in the skin side to ensure it cooks through. He also promised it would be delicious and that I would be back for more. He was right! Preheat the oven to 400 degrees. Position the rack in the second spot down from the top. Place an oven proof skillet (I used cast-iron) in the oven to preheat. Rub the skin side of the collars with salt and then rinse under water. This should help remove any of the naturally occurring slimy coating that might be there. Dry the fish with paper towels. Cut a number of deep slashes into the skin side to help promote even cooking. Rub oil over both sides of the collar and then sprinkle both sides with salt. Don’t be shy with the salt. Once the oven has come to temperature, carefully remove the extremely hot pan. Place the collars skin side down. Cook for 10 minutes and then flip the collars. Cook for another 10 minutes or until they are brown on both sides. I love this dish and I’m going to try to make it for the first time. It’s always great with ponzu sauce at the restaurant – a citrusy soy sauce. I bought some of these at an ordinary grocery store when I was in Hawaii. They were cheap compared to the other fish, so I thought, why not? I cooked them on the barbie with Korean bbq sauce, and the results tasted great, but were more of an appetizer than a main. Dig for the good stuff! Fins and all, they were even visually appealing. A prized dish at many Japanese restaurants (known as hamachi kama), it is often served with grated daikon. Add a touch of soy sauce to the daikon and take a bit of the daikon/soy sauce with each bite of the yellowtail. My favorite sushi restaurant serves this with lemon slices to squeeze on top. We always “fight” over the dark meat pieces closest to the bone. It is a delicious treat!